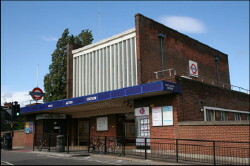 West Acton is one of 16 London Underground stations that have been given Grade II listed status which marks them as ‘particularly important buildings of more than special interest’. West Acton Station was built to designs by Brian Lewis, chief architect to the Great Western Railway, and opened in 1940. It replaced an earlier station building of 1923, built as part the Ealing & Shepherd's Bush Railway, a joint venture between the GWR and the Central London Railway. Although built by the GWR, the new station formed part of London Underground's New Works Programme which ran from 1935-1940. 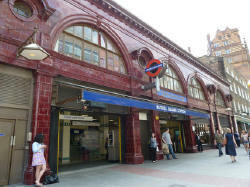 The English Heritage selection features many glazed tile stations, such as Belsize Park, Chalk Farm and Covent Garden, with their familiar ‘ox-blood’ colour scheme devised by Leslie Green. The list in full: Aldwych, Belsize Park, Brent Cross, Caledonian Road, Chalk Farm, Chesham, Covent Garden, Hendon Central, Oxford Circus (two separate buildings), Perivale, Redbridge, Russell Square, St John’s Wood, West Acton and Wood Green. In addition, Arnos Grove, Oakwood, and Sudbury Town, modernist works by Charles Holden, have been upgraded from Grade II to Grade II*. "The London Underground not only set the standard for progressive transport systems, but has displayed a remarkable commitment to quality and consistency of design. The stations awarded listed status today are as valuable to London's architectural story as many more famous buildings like the Houses of Parliament.
'' From the distinctive and instantly recognisable glazed red façades of the early 20th century stations such as Belsize Park and Russell Square, to the Modernist designs embodied in Arnos Grove and Sudbury Town, we have been left an amazing architectural inheritance. ''It is absolutely right that these stations be afforded the recognition and protection provided by listing."